There is a lot of driving involved in this trip. Because of the distances, we'll have two nights in motels on the way to Yosemite and one more night before we head back to Tucson. 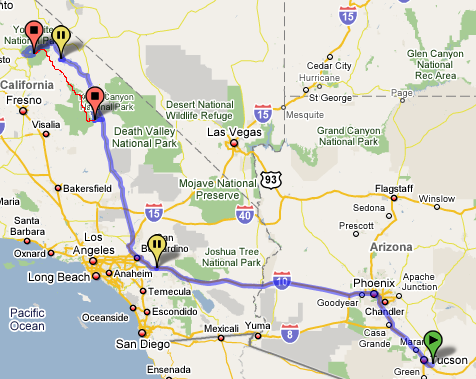 On Friday, July 18th we'll drive to Banning, CA and stay at the Super 8 motel. It's a 420 mile drive to Banning, so we'll have to leave Tucson about 9:00 AM that morning in order to get there at a reasonable time. The cost for this first hotel is about $60.00 per room per night. You might want to consider sharing a room with one of the other backpackers. On Saturday, July 19th we'll arise early and make the 240 mile drive to Lone Pine and the Whitney Portal trailhead. There we'll have lunch and meet our shuttle driver. Then we'll load our stuff into his vehicle, lock our vehicles for their one-month layover, and let the driver take us the rest of the way to Mammoth Lakes. I haven't made shuttle arrangements yet, of course, but will do so prior to our trip. I'll consult everyone and we'll make a decision at the proper time. Some possibilities are available, but they can be a bit tricky to contact. In Mammoth Lakes we will stay in a Motel 6. This motel is just a bit more expensive than the last one at about $75.00 per night. Again, consider sharing if you'd like. The next morning we'll have to get up early in order to catch the 7:20 AM YARTS bus for the $15.00, 105-mile ride to Yosemite. The bus leaves from the Shilo Inn just 1/3 of a mile east of our motel. Once we get to Yosemite at about 11:00 AM on Sunday we'll pick up our permit and hit the trail as soon as possible. Our simple goal this first afternoon on the trail will be to get to Clouds Rest, less than seven miles away. It'll be warm, but we'll take it relatively easy and enjoy Vernal Falls and Nevada Falls along the way. Be ready to go when we get to the park! After our trek, we'll find our vehicles at the trailhead and travel a short distance back down the road to the great little town of Lone Pine. We'll stay at the Comfort Inn. This hotel is more expensive than the others, but I think the cost is worth it after such an arduous trek. Our itinerary should get us into Lone Pine on Friday, August 15th. We'll make our reservations for that day and hope for the best. We might be able to change them along the way if necessary. We'll make the very long drive back to Tucson on Saturday, August 16th. We will each have to make our own hotel arrangements. It doesn't cost anything to make the reservation, so get your rooms early! I may make my reservations up to six months out from the trip dates, which means February or March. That's not unreasonable, and reservations are free! Just be sure to make adequate notes so you can cancel later if necessary. Of course, everyone who goes on this trip will be expected to share in all other travel-related expenses. That means paying your share of the gas and paying your share of any other fees and general expenses. There will be many other minor expenses on both ends of the trip and along the way. Remember that we'll be stopping to resupply several times and at some of those locations you might have to or want to spend a few dollars. I would suggest each person carry whatever they consider an adequate amount of cash with them. My guess is that $100.00 is adequate.